The LNG-fuelled ferry is the first passenger ship in the world equipped with a rotor sail for wind-assisted propulsion. Viking Line has installed a rotor sail on the LNG-fuelled Viking Grace (see also CruiseMapper), making it the first passenger ship in the world equipped with a rotor sail for the utilisation of wind power. LR approved the structure and the risk-assessment related to the installation of the sail in line with its Guidance Notes for Flettner Rotor Approval. The approvals were conducted to ensure that the Flettner rotor would not adversely affect the safe operation of the ship or the safety of the crew. The rotor sail, developed by Finnish company Norsepower Oy Ltd, is expected to cut fuel consumption and reduce emissions (by up to 900 tonnes CO2 annually). Viking Grace is already operating on wind assisted voyages between Turku, Finland and Stockholm, Sweden. 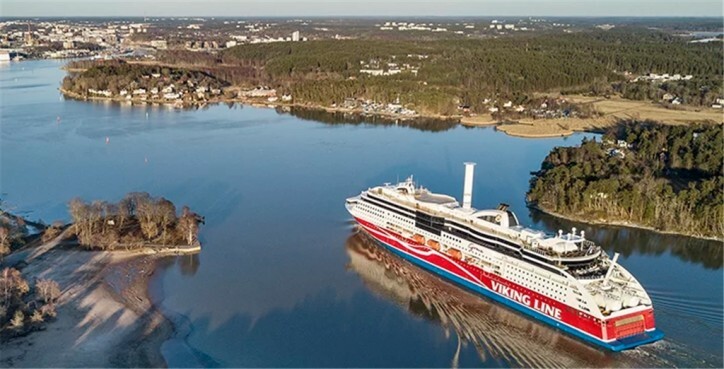 The LNG-fuelled ferry has been in operation since 2013 when LR helped Viking Line handle the complexities of the LNG tanks on the stern deck as well as its regulatory, class and operational requirements. The cylindrical rotor sail installed on Viking Grace is 24m in height and 4m in diameter and uses the Magnus effect for propulsion. As the rotor is spinning, the passing air will flow with a lower pressure on one side than the opposite side. The propulsion force created by this pressure difference drives the vessel forward. The rotor sail operation is automated and the system will shut down in response to any disadvantageous changes in the direction or force of the wind. “The use of wind power reflects Viking Line’s green values and we want to pioneer the use of solutions that reduce impact on the environment. Based in Finland, Norsepower has developed a world-class mechanical rotor sail solution that will reduce fuel consumption. We are proud of the fact that Viking Grace will be the first passenger ship in the world to benefit from this innovative solution,” said Jan Hanses, CEO of Viking Line. In addition to the rotor sail solution installed onboard Viking Grace, Viking Line plans to use wind propulsion in the company’s new vessel, due to be operational in 2020. Built in China, the passenger ship will be equipped with two mechanical rotor sails supplied by Norsepower, doubling the wind power potential.